The support for supplementary features like the internal speaker, headphone jack, gyroscope, or lightbar varies between models, type of connection, and games/software. Supported natively by a growing list of games (see support in games) while also featuring native DirectInput support. Capable of making full use of Steam Input due to many overlapping features with the Steam Controller. Uses standard USB (Micro-B) and Bluetooth (v2.1 + EDR) HID protocols for communication..
..but exposes advanced features over the latter only via the custom PS4 mode. For the moment, only working with the official adapter. Lacks native XInput support, requiring the use of a XInput wrapper (see Windows) for games that do not support DirectInput or the controller natively. The controller does not support XInput natively; additional third-party software such as Steam or an alternative (Windows, Linux) might be required to use the controller in XInput-only games. V2 controller variation installs itself as an audio device and allows the use of the 3.5mm jack on the controller for audio passthrough. Use a micro USB cable to connect the controller to a USB port on the computer. The controller should automatically be recognized and installed by the operating system. Official peripheral; required if using PS4 Remote Play or PlayStation Now wireless. Games with native controller support may not work with the adapter even if they work with a wired connection. Installs itself as an audio device and allows the use of the 3.5mm jack on the controller for audio passthrough. Recognized as a DirectInput controller while plugged in, regardless of whether an actual DualShock 4 controller is pair with the adapter or not. This can cause issues with games incorrectly assuming a controller is connected. Push in the wireless adapter towards the USB port until the light bar starts to blink rapidly. Hold down PlayStation+Share at the same time until the light bar starts to blink rapidly. The controller and adapter should automatically find and pair with one another within a second or two. When completed the light bar of both will stop blinking rapidly. To turn off the controller press PlayStation+Triangle or hold PlayStation for ten seconds. Games with native controller support might not support Bluetooth connected controllers; requiring a wireless adaptor, wired connection, or a XInput wrapper instead. Official Sony PlayStation services such as PS4 Remote Play and PlayStation Now do not support Bluetooth connected controllers. Hold down PlayStation+Share at the same time until the light bar starts to rapidly blink. Navigate to the Bluetooth settings of the operating system, select "Wireless Controller" and pair it. If asked for a pair code, use 0000. If the controller have already been paired with Windows previously using Bluetooth, it might be required to remove existing older pairing in Windows before trying to re-pair the device again, as Windows otherwise might not discover the device. Double inputs, games with native support might see the controller as an Xbox controller. Turn off or disconnect the controller from the computer. Turn on or connect the controller to the computer again. Steam should now detect the controller (usually signified by the light bar changing color) and allow the use of it in XInput-only games, while also supporting custom configs using the Steam Input controller configurator. This feature is what causes the double input issue in games that natively support the controller. Disable PS4 Configuration Support before playing affected games to solve the issue. 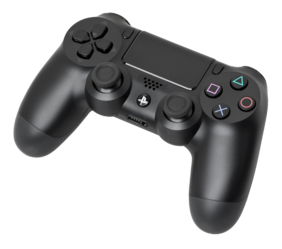 For a list of games, see games with DualShock 4 controller support. Games with generic DirectInput support are supported by the controller, however button placements may be out of place and need to be rebound. Refer to game-specific articles for rebinding support. Supported natively by a growing list of games, allowing the use of the controller and some/all of it supplementary features without any additional software installed. Support for some controller features may be only available on certain systems. Refer to game-specific articles for details. Acting as native DirectInput controller, it's possible to use any of the generic wrappers. See the controller article for those. Extensive program with high amount of customization. Can be used as XInput, keyboard and mouse wrapper with macros or just as an extend of the controller to use controllers features like touchpad, gyroscope, haptic feedback and lighbar. Lightbar support can't be disabled and it will overwrite and can interfere with games' own support. This is caused by controller showing up as two, first as native DirectInput controller and second as emulated XInput, Xbox 360 Controller. Under Profiles tab, select desired profile and edit it. Under Controls tab, from lower right corner, check "Use Dinput only". This makes it easier to enable XInput with game-by-game basis if game doesn't support the controller or DirectInput. Under Settings tab, check "Hide DS4 Controller"
This makes the controller always show up as single XInput controller, making controller work properly with majority of modern titles. Some software like Steam, Uplay, GeForce Experience or UWP apps prevent this from working consistently. See below. Earlier known as DS4Tool and DS4Windows, not to be confused with current DS4Windows. An unofficial continuation of the ScpServer DualShock 3 driver set, it simplifies the installation process and provides expanded functionality over the original drivers. It also includes its own drivers for PlayStation 4 controllers. See the GitHub repository for details. Controller is natively supported since kernel 3.15. Light bar support may require additional tweaks. For games using the FNA engine, refer to the engine article; for other games, refer to the game-specific articles for details. This is caused by using a XInput wrapper with a game that natively supports both DualShock 4 controllers and XInput devices, causing the game to use both the actual hardware and the virtual XInput controller at once. Close any installed XInput wrappers, such as DS4Windows, SCP, InputMapper, Steam (if possible), etc. Disable the global/game-specific option to wrap the controller in any installed XInput wrapper. Example: Disable PS4 Configuration Support in Steam. Uninstall any installed XInput wrapper. Enable the Hide DualShock 4 controller option in the XInput wrapping software, if one exist. Use a third-party tool like Special K that includes this functionality (set DisablePS4HID to true). This is most likely caused by game being designed for XInput controllers only, but still taking inputs from DirectInput controllers. What this means is that game is reading Dualshock 4 controllers shoulder axis which are not centered as right stick. See the controller glossary page for more information. For Unity games with no launchers hold ⇧ Shift to access the launcher as the game starts, then select the Input tab. Check the wiki article for the desired game to find a different rebinding solution. Configuration files may hold such settings. For Dualshock 4 specific methods, you can see OS specific solutions above. For generic DirectInput and per game solutions, see controller article. Worn analog sticks are a known issue and Sony should've changed rubber material for new controllers. If the controller is still under warranty contact Sony or the retailer for replacement instructions. Worn sticks can also be replaced manually (follow this guide). This page was last edited on 8 April 2019, at 15:17.